And today, I’ve got four videos of Goldbergian goodness to share with you. When it comes to devices with many moving parts in complex interactions, it’s hard to top watches with their myriad of miniature gears, wheels, and other intricate details. Built on a tilted table, “Magnets and Marbles” is not a true Rube Goldberg device — there was never one complete uninterrupted run — but it remains a thoroughly impressive design. 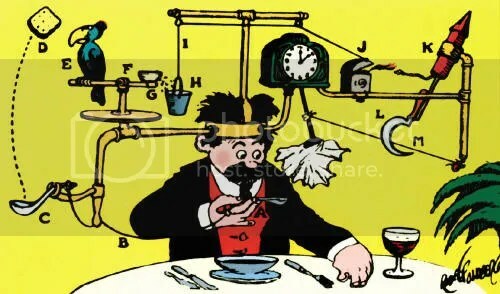 Rube Goldberg devices are only growing more ambitious, audacious, and creative, and I cannot wait to see what people come up with next.